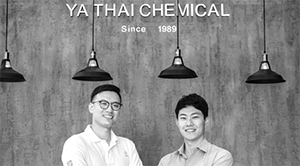 Ya Thai Chemical builds upon the foundation of honesty, integrity, progress, and advance. environment, and honoring integrity with suppliers and customers. 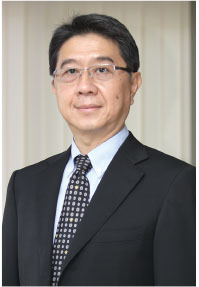 YA THAI Chemical was founded in 1989 by Mr.Jyh-Rong Liang in Bangkok, Thailand. We are part of the network of Ya Chung Chemical Group (亞中集團) headquartered in Taipei, Taiwan. Our focus is on specialty chemicals for the metal surface finishing industry located in Thailand. Over the years we have been distributing internationally recognized partner companies from all over the world to in-house applicators as well as job shops across all industries such as the automotive, aerospace, electronics, furniture, and the civil industries. 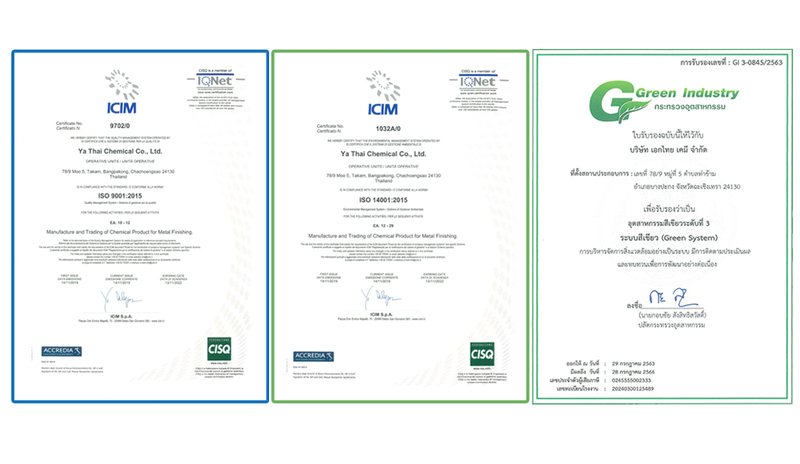 Our company first obtained ISO certificates in 2004. In 2017 we acquired ISO9001:2015 for Manufacture and Trading of Chemical Product for Metal Finishing and ISO4001:2015 for Environmental Management related to Manufacture and Trading of Chemical Product for Metal Finishing. Originating from Japan, Dipsol Chemicals is one of the market leaders in the corrosion protection solutions industry. In Thailand they offer the advantage of local production and lab support to all customers. MacDermid Enthone Industrial Solutions provides solutions for the global surface finishing industry, integral to many of the surfaces we touch every day, plus high performance applications in virtually every industry. Currently, our activities are focused on the zinc plating market and we have a full lineup range of chemicals for zinc plating from cleaner and passivation to waste water treatment chemicals. KIZAI CORPORATION are a manufacture and sell the surface treatment chemicals on the Pre-Treatment Chemicals, "Plating" and "Stripper agent" and "filtration machine" and "filter media". Titan Innovation specializes on all things titanium ranging from selling titanium material to any fine-processing of titanium products such as heat exchangers, titanium baskets, anodizing jigs and even insoluble anodes. A leading producer specializing in plating machinery manufacture including Electroplating Industry Full-set & Layout Facilities together with Environmental Pollution Protective Equipment. epunion is a chemical company specialising in metal surface finishing solutions. The brand was conceived back in 1985 from Taiwan. 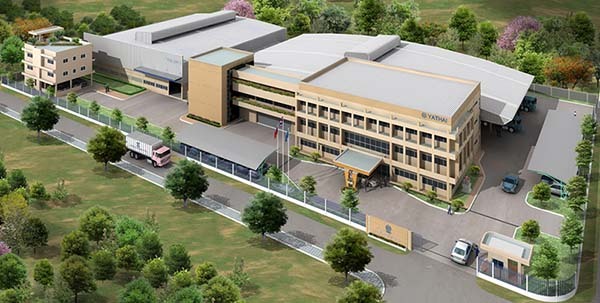 Early on manufacturing operations started in Thailand since 1989 which has since grown to have an international presence across the Asia region. Founded by a group of entrepreneurs this Italian company specializes in developing environmentally friendly polymer-based lubricants that offers superior lubrication. The global leader in providing casting impregnation equipment and impregnation sealant as a solution to the universal problem of porosity in castings, powered metal components, and electronic components. At Delaware, USA in one of the leading professional special chemical suppliers in metal finish industry. Metchem special chemicals are widely applied in the manufacturing of products of Seagate, Western Digital, Hitachi, Canon and Ricoh international leading companies. The Hawking name has been associated with the development and marketing of specialist electrophoretic coating systems since 1985, with a distribution network that extends into some 30 countries worldwide and growing. Copyright © 2017 Ya Thai Chemical Co.,Ltd. All Rights Reserved.